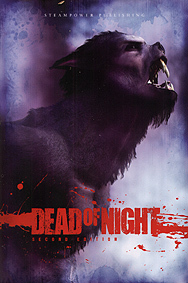 Dead of Night~ is the roleplaying game of campfire tales, slasher movies and b-movie horror. It is a game of screaming victims, unstoppable killers and slavering monsters, where the horror movie clich�s flow thicker than blood ad the only victory is survival. Dead of Night is designed to be easy to learn and quick to play, with rules that help you tell horror stories without getting in the way of the fun. The rules are simple and straightforward, yet offer all the options and depth to allow you to customise the game however you like.